Obica is an international chain of mozzarella bars, with restaurants in Italy, the US, Japan and Dubai. It also has five in London, with the latest, in St Paul’s, having opened in March. 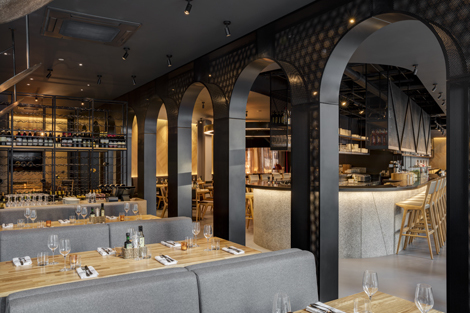 The new flagship Obica St Paul leads the way for a “design-led renovation of all Obica eateries in the UK and a worldwide expansion of the brand”. 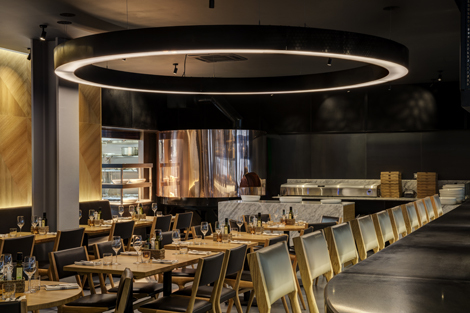 Raimondo Boggia, CEO of Obica, says: “We are very excited to bring to the City a cool restaurant with the freshest and finest Italian delicacies, plated in a contemporary style. We want to be recognised for the best mozzarella di bufala and the best pizza in central London, nothing less”. It was pouring with rain the evening I rushed to this restaurant from Blackfriar’s Underground station. It wasn’t busy so there was plenty of choice when it came to where I sat – there is a section along the left-hand glass wall that looks more intimate, as well as a sit-up bar. (This Obica can seat 120 people in total.) I was offered a table around the other side, in view of the copper pizza oven. 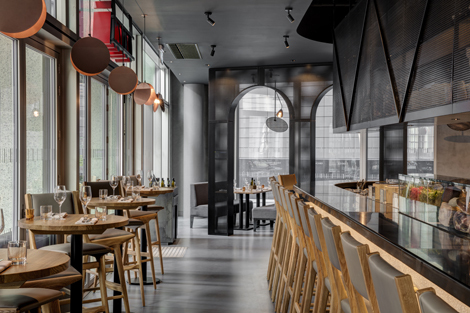 The modern, open-plan interiors feature oak wood furniture, grey concrete floors, blackened and stainless steel, stone and leather. The effect looks smart but because of a lack of customers, I felt like it was lacking in atmosphere. I can imagine it being quite bustling during weekday lunchtimes. Obica St Paul is a good place for office workers. Once seated, I was delivered water and a drinks menu, with a mention of the house-made syrups, fresh juices, purees and infusions used to make the cocktails. After deliberating for a few minutes, one of the waiters returned to offer a recommendation. 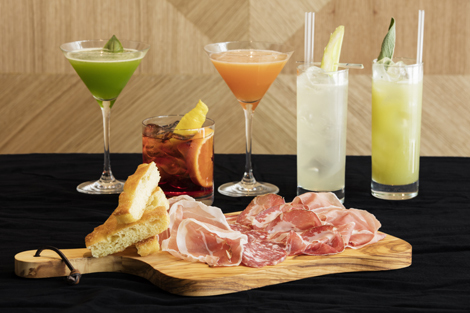 The choice is limited to four classic Italian libations such as the Negroni (£7), a few long drinks, and a selection of martinis (£8). I accepted the suggestion of the Vizio, made with Rey whisky, Cynar, DiSaronno and rhubarb bitters – it was delicious but the sweet almond accent from the Amaretto meant it would have been better drunk after dinner. Another time I will go for Nirvana, made with celery-infused gin, elderflower liqueur and fresh citrus mix. During “aperitivo hour” at the bar (3.30pm-7pm) you can get cocktails for £5.50 and wine for £4.50 a glass. All the wines on the menu are Italian, with reds ranging from £28 to £150 a bottle. Red by the glass is from £7 a glass, white from £6. With the meal, which was delivered as small plates in no particular order, we had a bottle of the 2011 Belguardo Bronzone Riserva, Morellino di Scansano, from Maremma, Tuscany. It was supple with rich cherry fruit. Obica is a good place to come for a quick bite with colleagues or a casual meal with clients. The concept is sharing plates, though, so be warned if you feel awkward about that. If you are worried about mozzarella being the only thing on the menu, you don’t need to. Although it features prominently (the mozzarella di bufala DOP is imported directly from Campania, Italy, twice a week) there is also salumi, various antipasti, salads, soup, pasta, meat, fish and, of course, pizza. 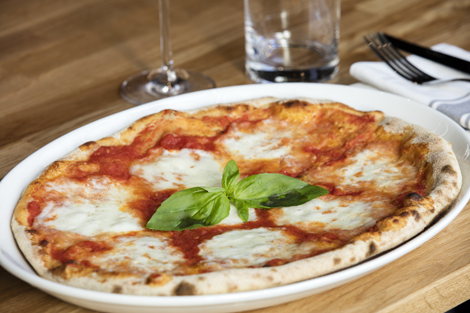 Pizzas at Obica St Paul are prepared with stone-ground flour imported from Italy, and the dough is left to rise for at least 48 hours. Not being a connoisseur of mozzarella, I let the waiter talk me through the taste profiles and then decided on the ricottina di buffalo (creamy and slightly sweet, £6) and the naturally smoked bufala affumicata (£6). Each piece is served as the entire ball, and goes well with some crispy home-baked focaccina flat bread with sea salt and oregano. (Serving it in a brown paper bag was a nice rustic touch.) It’s also a lot for one person so note that one ball is enough for two people. 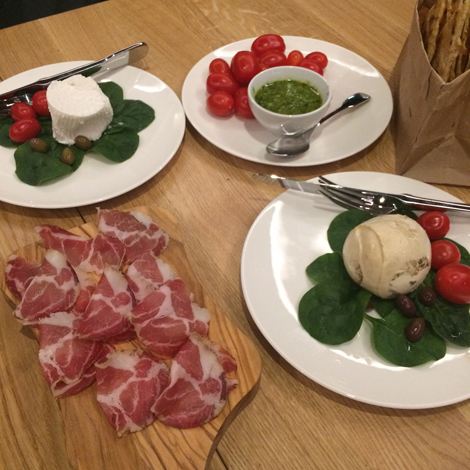 We also ordered the Datterini tomatoes with basil pesto (£5), which I felt could have done better in terms of presentation (the might have been nicer sliced and mixed with the pesto), and the creamy Burrata bruschetta with anchovies. The salumi, which comes laden on wooden boards, includes Prosciutto Crudo San Daniele DOP (£6), Prosciutto Crudo di Parma DOP (£5) and Bresaola della Valtellina IGP (£6). Wanting to sample some of the other dishes (in the name of research), we went for a modest portion of the tasty fresh ravioli (£13) with sage butter sauce (again slightly lacking in “wow” factor on a small white plate), and the well-cooked aubergine Parmigiana (sliced and topped with cheese and tomato, £7). The waiter also encouraged us to try the black rice and octopus salad (£12), which was very disappointing – chewy, flavourless and over-priced. We didn’t have the appetite for dessert but the flourless chocolate and almond cake with fior di latte ice cream sounded lovely. (And probably would have gone well with the Vizio martini.) Limoncello and grappa take you back to that holiday in Italy you had. The staff were very welcoming, helpful and enthusiastic. If anything, I would say our waiter tried too hard to make recommendations, and didn’t really get them right. I wasn’t convinced he’d actually had the chance to eat and drink the things he was promoting. A smart place for a bite to eat during or after work hours. The food is decent but lacking in imagination when it comes to presentation (fresh spinach leaves and Datterini tomatoes seem to appear on every plate). I think the pizza probably would have been a winner but I will have to go back to for that. OPENING HOURS Mon-Sat 11.30am-10.30pm. Closed Sun. Deli Mon-Fri 7am-3pm. PRICES £11-£18 for a pizza.